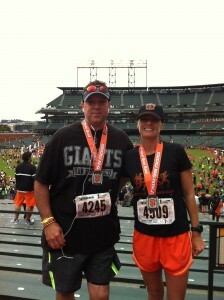 It’s been a few days since the Giant Race Half Marathon that both Mike and I ran in San Francisco. It’s also been a few days of recovering and letting those legs rest and relax, but also get some stretching and icing in. 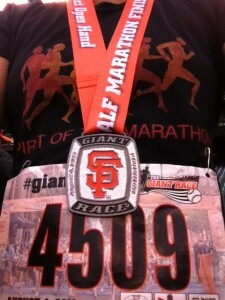 Going into this race, I had been helping my friend’s husband, Mike, train for his first half marathon. You can see my previous posts for updates on his progress along the way (June 19 and July 19). Everything was going really well and I was excited for him. I enjoy helping other people train for races and to see how they progress, feel along the way, and work toward their goal. However, a couple weeks ago, Mike told me he tweaked his hamstring and this made me nervous. So I told him to rest and be careful with his last couple weeks of runs. The last week he didn’t run at all, but I preferred this than having him push too hard and injure it any further. A few days before the race I touched base with him. He hadn’t been running. But he assured me he was still going to run the race. He said, “It will have to be torn for me not to run”, and then confidently said, “You will see me cross [the] finish line running.” I knew he was still in this race! I could see the determination he had. 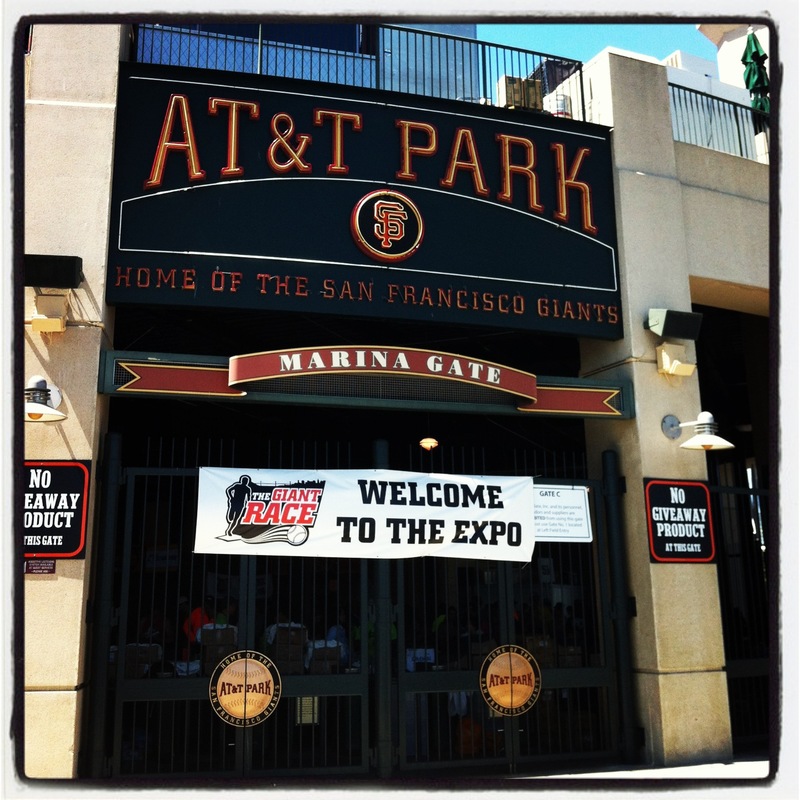 I had planned on attending the Expo at AT&T Park with him to kind of walk him through everything, his first expo, but he arrived to S.F. earlier than we did (Clint and I), so he and Rosemarie (his wife and my friend) did the whole expo thing themselves. They wanted to get it over with early. So they were in and out of the expo in like 30 minutes. Got the bib, bobblehead, shirt and headed out. I got there a couple hours later and had to wait in a long line, but got my goodies as well. Clint and I also perused the vendors and got some fun photobooth photos taken with SF Giants paraphernalia, won some tickets to a baseball game, drank some cocktails with friends, and made our way to the Giants Dugout store to buy some tall socks to wear during the race. We were there for like two hours! Later that evening, we had made plans to meet up with them for dinner to carbload. We ended up in North Beach and ate at an Italian restaurant called Calzones Pizza Cucina. We had delicious pizzas and talked about running. I’m sure Clint and Rosemarie were bored with our running talk. It was getting later in the evening so we were talking about prepping for the morning, where to meet, corrals, and all the things that go along with race morning preparations. Mike was in good spirits and was excited. After a fun dinner, we went our separate ways and I got my banana, Clif bar, and KIND fruit and nut bar for the morning at a corner store on the walk back to where we were staying. I laid everything out like I always do to prepare for the race and set the alarm for 5:30am. 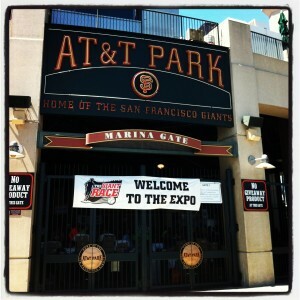 5:30am came fast and I got dressed and we headed out the door to meet Mike at AT&T Park. On our quick drive, we passed by a few nightclubs with lines out front with people waiting to get in. I laughed! As we are getting ready to run a half marathon, there are people in S.F. waiting to get into clubs! These people are either ending their nights or maybe even starting their days with a little club action at 6am. As I walked up to the starting area, I practically bumped into Mike and Rosemarie waiting just outside the corral area. It was good to see them! We waited in a porta potty line and then went to our corrals. I wished Mike good luck and told him he would be just fine. I got in my corral and found the 1:40 pacer. I kind of decided last minute I would try to beat my PR from a few years ago, so I would have to stay with the 1:40 pacer to do that. And the race started at 7am! Let’s do this! As I started my running watch, it failed to start because it was full with past races and training runs stored in it, so I couldn’t keep track of the miles and had to use it only for pacing myself. Oh well! I could stick with the pacer and I would be fine. I didn’t run with Mike so I just hoped that everything would go well along the way and he would finish. The course was pretty nice with only a few hills. The last one was the toughest about 3/4 of the way through the course. The Golden Gate Bridge looked beautiful and we got to run the second half along the water for a bit. I wanted to stop to take photos, but didn’t want to screw up my time. As we got closer to the finish, people started to pick up their pace and that helped me get a little more speed. 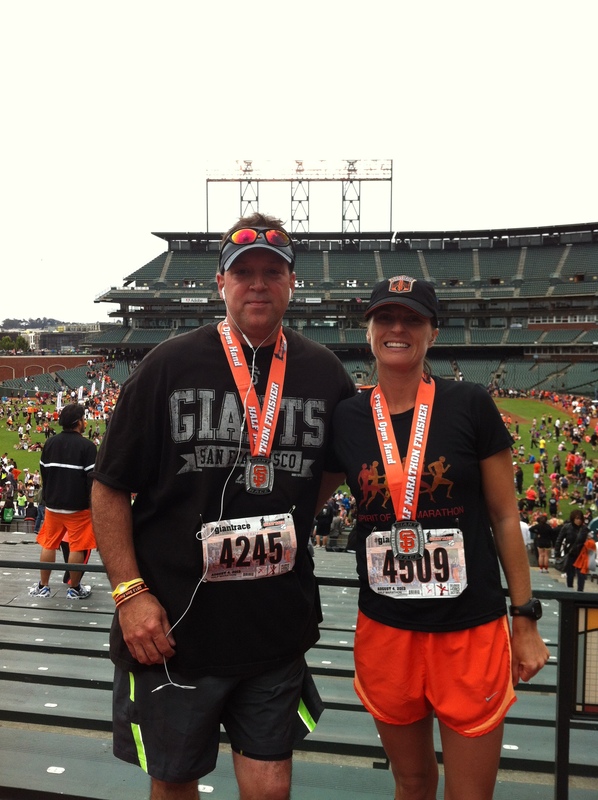 As we approached the finish, AT&T Park was in view and we got to enter from the side of the stadium and run onto the field! So cool! And Lou Seal, the Giants mascot, was there to greet us and cheer us on at the finish line. I gave him a high five right before I crossed the finish line! The best part was our glittery medal. It looked like the front of the World Series ring. I got a little bling! I looked for Clint in the bleachers and then made my way around the field to get food, water and pictures taken by fellow runners. Friends and family couldn’t come out onto the field, so strangers were taking pictures of other runners. Everyone was having fun out there! I met up with Clint, Rosemarie and Mike’s family in the bleachers. We were waiting to see him cross the finish line. He texted Rosemarie when he was 3 miles away, so we knew he was coming soon. We saw him cross the finish line with a time of 2:12:13! We were all very excited for him! He wasn’t limping and looked good, so I thought everything was okay. However, he said that from Mile 1 he was having pain in his hamstring, but he was determined to get to the finish and he didn’t even walk. I’m really proud of him. I know going into a race with an injury is tough. Sometimes you don’t know if you should run the race or not, but determination also takes over and with Mike, he absolutely wanted to complete this race. He wasn’t going to let anything get in the way of that. This was a special race for him being a huge SF Giants fan. He ran his FIRST half marathon…his first 13.1 miles! What a great accomplishment! What I really take away from this is [there's a] crazy big difference between running and training. 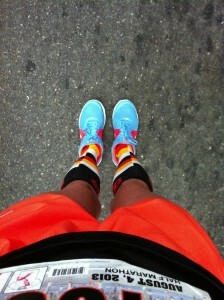 Now I can go back [to] just running until I sign up for another race.” I love it! I can’t wait to hear what his next race is going to be. All smiles here from his virtual running coach. Go Giants and Go Mike!